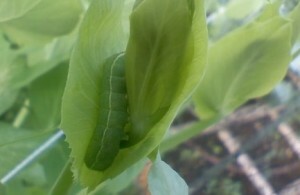 Is this an entomology or garden blog? Here is yet another pest, this time in the peas. Along with this guy, the leaf beetles seem to be out in full force. Until I planted this garden, I didn’t seem to notice the damage the beetles do around my yard and even throughout the neighborhood. The trees in my front yard have substantial damage in many of the leaves (that I can see). I have been spraying a neemoil solution on the leaves of the vegetables that I won’t be eating (potato, bean, broccoli, etc) which seems to help until the next time it rains. Once it is washed away, it doesn’t take long for the little buggers to dig in again. I only found one of these caterpillars, so I am not too worried about these yet.